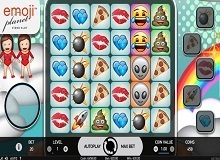 Emojis come to life in NetEnt new video slot game. Emoji Planet online casino slot online game gives you a new experience full of fun with all the cool graphics and emojis. The main theme of planet emoji game is our daily used emojis. Emoji Planet slot got thirteen cells of symbols, 5 reels and six rows displayed at the main screen. There different types of symbols in this machine, any player will be able to find wilds and bonus elements and different prize features. NetEnt surprised us with this new online machine slot that doesn’t have paylines like ordinary slot machines, instead, it got cluster pays system. Cluster pays system means that there isn’t a fixed payline like the standard slot game and wins can come from anywhere of the main screen. All you need to do is connect five or more identical symbols, vertically or horizontally, and you will win. The Emoji Planet has two main groups of icons, the lower-paying characters, and the high-paying characters. The lower-paying characters include pizza, lips, bomb, and a rocket. The high-paying characters are the alien face, the pile of poo and the emoji with tears of joy. Wild Symbols in Emoji Planet can replace for any other icon in order to complete the winning set. The bonus games are very interesting and fun as they are formed from the lower-payed characters and each one of them has its own function. Here are some tips on what these symbols do when combined together in order for you to form a strategy. But, remember, these are not rules. The Bomb: when activating the bomb it makes eight random symbols to explode. For each symbol destroyed your coin win will randomly be multiplied between five and ten times the bet. Pizza: activating the pizza random symbols will be replaced by a 3×3 pizza pie, which means that the pizza symbol will transform into those 9 random symbols giving you a higher chance of winning. 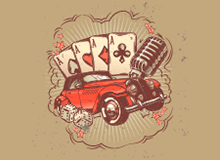 The Rocket: this symbol will surprise you by creating a stack of ten WILD symbols to create for you a winning combination. Heart: when activating the two hearts symbol the total payoff is increased for a plus one multiplier and is dependent on how many times the meter has been filled. Emoji Planet is totally different from all other online slot machines but you will definitely enjoy it like no other game. There are ten betting levels that you’ll go through while playing Emoji planet slot machine online game and the coin value is between one cent and one euro. Minimum bet is twenty cents and the maximum bet is two hundred euro per round. Winning in Emoji Planet slot is no big deal, especially with all the cool features that are made specifically for this cool online slot machine. It is not like any other game, which makes it even more fun. 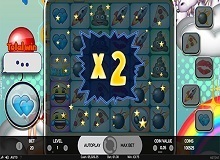 You must know that there are no cheats in this game, however, you can play it for free at first in order to get to know the game more before playing Emoji Planet slot for real money as the interface and features may be different than other slot games. Know that this game doesn’t offer any jackpots, mainly because you wouldn’t need it much as the highest payout you can get is up to 100,000 per round. To win, you will mainly need to be familiar first with the interface and the features for each symbol and the bonus rounds. You will be able to find the autoplay button that will get the game to form different combinations with no interruption and you can set the maximum bet in one click. It is not like any other game, but we have to admit that as much as it is fun it is also very easy to play. The cluster pays system makes it a lot cooler and fun and higher the chances of winning as you can combine the symbols horizontally or vertically just get 5 or more symbols to touch each other and you will have a win. It’s as easy as that. Besides the cool emoji theme, the graphics are super cool that makes the game even more enjoyable. You will be able to play Emoji Planet free game on your mobile phone as you can download it and then start playing so you can play it everywhere you go.